Camping/accommodation: This trail is very weather dependent for camping as a lot of the land is marshy/bogland. There are some remote sections that would be suitable if you managed to be there on a dry day (we did not). We stayed at Meadow Sweet AirBnB, 5km south of Finntown and right on the trail. Can definitely recommend to other walkers! 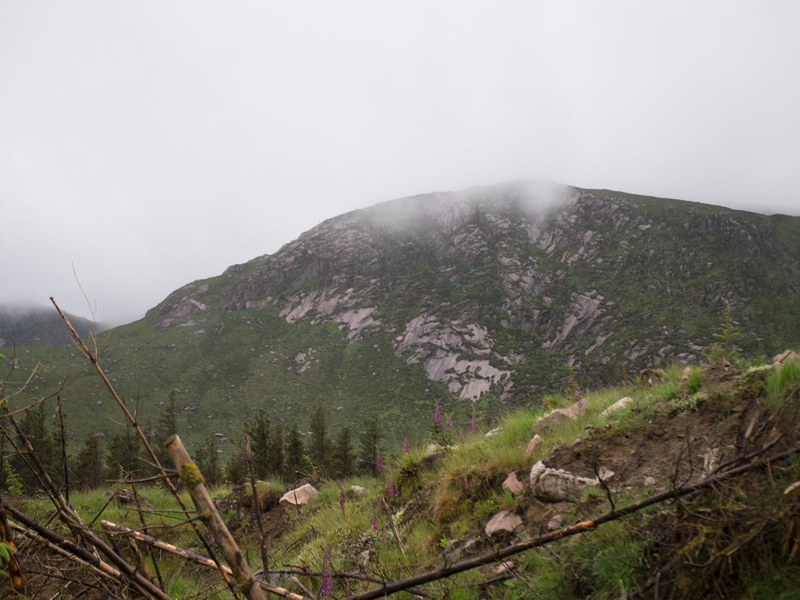 SlÃ­ na Finne is our third trail in Donegal, and the second section of the SlÃ­ Dhun na Ghall. Our previous Donegal trails were the Bluestack Way and the SlÃ­ Cholmcille. As a loop, the easiest places to start/end the trail are probably either Fintown or Cloghan, two small villages about half way through either side of the route. The walk is named after the river Finn, and the Finn glacier valley that it runs through. One thing to mention is how fantastic the local link buses have been in rural parts of the country - linking so many small towns, and they're only ever a couple of euro. And so, we took the bus from Ardara (having finished the SlÃ­ Cholmcille the night before) to Fintown, and arrived with a mild drizzle. It's the first rain we've seen in over a week. While we took the earliest bus available, it's already past 11am. There's a small village shop where we grab our usual "hiking food" of digestives, fruit cakes, and wine gums. The start of the trail was a little ambiguous, and we wander up and down the main road, shrinking against the wall to avoid the puddle tsunamis triggered by passing traffic. On our maps it looks as if the trail starts down a small twisting lane lane. Following it, it brings us to a train station of odd proportions. It's certainly not miniature, but maybe child sized is accurate. I don't know much about trains, but I know that the tracks are normally much bigger than that - and while I'd like to think I might have magically grown, I gave up on those dreams long ago. It turns out that Donegal once boasted of over 200 miles of narrow gauge rail. Set up in the 1880's-1890's by Light Railway Orders, these days The Fintown Railway is the only operational railway in Co. Donegal. 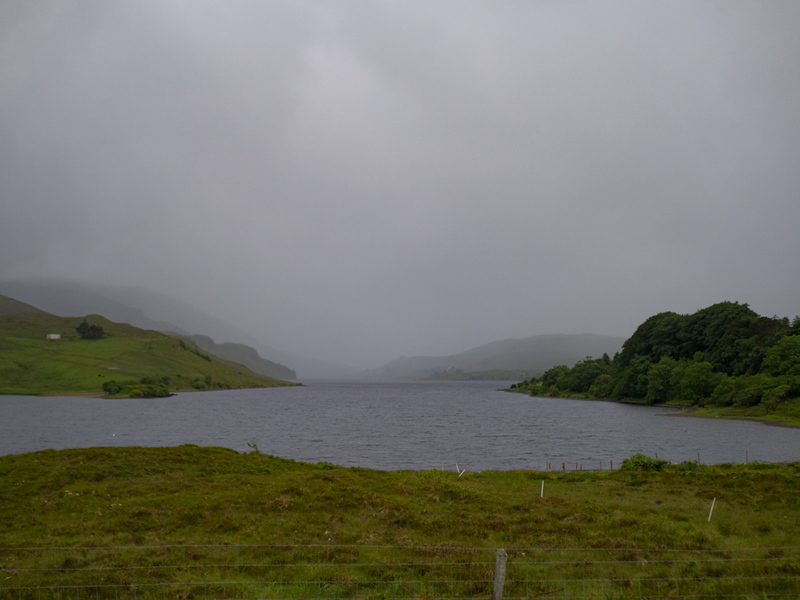 It runs along the shores of Lough Finn for roughly 5km, and is open during the summer months. This year they were later opening than usual as the engine was still being rebuilt after some serious repairs during the winter, so we didn't get to chug along the waters edge this time. It did explain the unusual train tracks that we had seen when passing through some bog on the Bluestack Way - I'd originally assumed it was maybe a special bog train. I wonder if it was built with a narrow gauge because there is a lot of bog or wet land in Donegal? I'm not sure. While wandering around this unexpected find we come across some of the guys who work there. They give us and our rather large bags a couple of funny looks, but agree that it's possible to walk north along the lake shore where the train once ran, which matches with what is drawn on our maps. We attempt to go that way, but it's pretty marshy and over grown. We give up on that route and walk back up to the main road. We head north, and finally come across an trail info board, which sends us further up the road. The big road turns off onto a small road, and then that turns into a sheep field, then back to small roads. There comes a point where you can take an alternative route and walk up to the SlÃ­ na Rosann. We stick to the trail at hand, and enter a forest. It's normal track for a while, but slowly becomes overgrown and wet. We had been lucky enough that all the bogs we had so far entered in Donegal were dried out from the unusually hot summer. It became clear, as we slowly picked our way around frog span pools and waded through chest shoulder high rushes, that the warm weather warnings had not reached the Finne Valley. We pass some beautiful old cottage ruins (we wonder why all Irish abandoned ruins have fuschia bushes) and make it back onto some sturdier ground.Once clear of the forest we sat by the road and snacked on some bananas. After a brief road section we're back onto farmland, and up start a long, slow incline. The higher we go, the less like farmed the land is, and the bog is once again surrounding us. There's no real trail to be found, but we meander along deer tracks, zig zagging back and forth across little islands of solid lands. We stop to look at some maps, and have a general moan about the terrain. I glance down and see a tick crawling across my hand. We quickly kill it, and vow to check ourselves over properly that night. We get a brief moment of excitement as we're looking back the way we've come, and see five deer leap out of the forest and start gracefully racing across the hillside. They make bog crossing look so easy. It takes us hours to cross a lowly set of hills peaking at 272m. As we cross down through a nice, dry sheep field we get chatting to a farmer. We're the only people he's ever seen walk down the trail. When we hit a road again I'm relieved. As we make our way down towards Cloghan we meet Leah, a friendly local adventurer that we'd previously met up with on the SlÃ­ Cholmcille. There's supposed to be bad weather coming in, and she very kindly puts us up for the night (after some very delicious chipper. It might be a clichÃ©, but hiking is the best sauce). The predicted storm didn't hit that night, and as we ate breakfast we weren't sure whether to take the day off in case it materialised, or just carry on, and hope some strong wind took it some place far away. But with the end of another trail in sight, we decide to keep going. Leah drops us back out to where we'd left off, and so we start the bottom half of the loop. After a short road section (and one wrong turn) we find ourselves beside the river Finn walking with some more of our best friends - sheep. The ground along here is raised and flat, and makes me wonder if we're walking along more forgotten railway lines. The weather worsens as we reach another stretch of road. It's a day of hoods up and eyes down, hunching against the pelting hail. At least road is easy to walk in this kind of weather, and thankfully the forestry that we enter is road-like too, so we push on. The trail then turns off into ... more bog. At first we're exhausted and battle our way down the slope. Clearing the forest we can see the marshy hills we have to cross ahead of us, and for a while a laugh and joke in the wind and rain - clearly having reached the delirious stage of our suffering. We make it across those few hills and shelter in a shrine. There's every version of Mary you could imagine, along with prayers and a collection plate. There's no small change there, all â‚¬1 and â‚¬2 coins. We wonder if these were left by other hikers who had also fought their way to this point and stopped for a break. Just in case it was lucky, we added our own coin. Looking out at the lashing rain, we knew it was foolish to do the second, higher hill crossing that lay ahead of us. Knowing something is foolish, and actually acting on that knowledge is something different, so it took us many shivering minutes to persuade our hearts that our brains were right. So when we stepped back out into the elements we turned right instead of left, and followed the road around the mountains. Looking at the maps, the road section was probably the slightest bit longer, but the mountains would have been such slow going that there's no knowing what time we would have reached the other side. Thankfully the roads are quiet and offered wonderful views. Once we'd made it back around by road, we connected with the trail again for two more kilometres of bog wading, before reaching a forestry road again. It's somewhere in this forest that you will find Meadow Sweet Herb Garden and Lodge. When we arrived I felt like there was more water on us than what was left in the sky. Thankfully Declan and Marion were used to hosting damp hikers, and we were able to light a stove in the lodge and hang everything around the living room to slowly dry out. They even invited us over into their house and fed us dinner. Storm Declan was still blowing and heaving when we woke the next morning, so we rolled over and stayed an extra day at Meadow Sweet. It was very peaceful, sitting inside and hearing the wind and the rain battling outside. I caught up on some writing, and we did a load of laundry. It's always so tempting to take a second rest day, but the skies were clear, so we packed up our stuff and started along the final 5km into Fintown. We're chatting about how much we enjoyed our stay as we walk back up their drive, and we look up to see a huge wall of clouds right in front of us. It was so black and just terrifying that it didn't look real. Suffice to say, we did not manage to make it back to Finntown dry. It was a beautiful walk in along some small roads, looking out over the lake and the Finn Valley in general. Arriving into Finntown, we made it back to where we'd gotten off the bus on our arrival, and settled in under our umbrella (munching on some extra wine gums after a quick shop stop). Some people laugh when we tell them we have an umbrella with us, but has earned its place within our bags quite comfortably. For filming in bad weather it offers some protection to poor Arthur (the camera), and when you're faced with a full day of rain it is so nice to be able to take down your soggy hood every now and again, and hear everything around you, feel the breeze on your face. While we were waiting for the bus an older gentleman joined us to hide from the rain. We chatted for a while, no one really understanding anyone else's accent. We took that bus to Glenties, and hid in a wonderful cafÃ© for a few hours waiting for our next bus to take us to Dungloe, the start of the SliÃ­ na Rosann. While we tried to not drip too much in this coffee shop we got talking to the other patron, who secretly paid for our coffees when he was leaving. We didn't realise until after he left, so I'm just going to leave a general Thank you! and hope that he knows how much we love coffee, and therefore love his kind gesture. During our afternoon sheltering at Meadow Sweet Marion called over to check we were getting on okay, and as we sat chatting she told us about some of the folklore of the local area. I'm not going to remember this stories perfectly, and I'm certainly not going to tell them as captivatingly as she did, but I hope you enjoy them none the less. There was once a young boy who wanted to become one of the strong men of the Fianna. When their leader Fionn Mac Cumhaill passed by one day hunting he begged to become one of his warriors. Fionn allow him to join, on the condition that the boy would return exactly one year and a day later to his family home to defend his family. The boy agrees, and leaves with Fionn, taking his three dogs with him. The boy and his dogs train and travel for a year, becoming as strong as the rest of the Fianna. The night marking the end of the year, Fionn takes the boy aside and tells him that he must make it back to his family the next day, no matter how long or tiring the road may be. The boy says he will race back and see his family once more. And so on that final day the boy begins his journey home. He crosses miles and miles, and as evening is setting in he can see the mountains of his home-place. He starts to recognise the woods and trails, and decides to rest a while. Looking for a place to stop, he comes across a litter of piglets. Not seeing the mother boar anywhere, he slaughters the piglets and has a feast. Tired from travelling and eating, he falls asleep. He wakes just as dawn is breaking, and realises his mistake. He and his hounds start to make haste, hoping to still make it home. They start to leave the camp fire and get back on the road, when they hear the anguished howls of the mother boar returning to find all her babes killed. She begins to hunt them, always slowly gaining. The first dog stands to fight the boar, allowing the boy and his two other dogs to escape. However, as the boy and his hounds reach the first mountain pass the boar has caught up to them, and his second hound turns and fights the boar. He is so close to home, but the boy is exhausted from his long journey, and fording the Finn River, the boar is almost upon them once more. And so the final hound stops, and fights the boar in the river. It is a close battle, but the boar wins for the third time, tosses the dog aside, and sets off again seeking revenge. The boy is in the mountains beside his home when the boar catches up to him. His year of training does not fail him, as they start to war back and forth across the side of the mountain. The boy has a sister, who hears their terrible fighting down on the valley floor. She immediately rushes to his rescue, swimming across the lake towards their battle. However, as she is nearing the far bank the echoes confuse her, and she thinks that her brother is in fact back on the other side. And so she swims back and forth, trying to find where her brother is fighting until, exhausted, she drowns in the lake. The boy and the boar's fight a long and gruesome battle, digging into the earth as the gain and loose ground, back and forward. Eventually they kill each other. All their fighting had carved a large hole in the earth, and when that filled with water it became Lough Muck (lake pig in Irish). Lough Finn was named after the boy's sister who drowned in the lake trying to reach her brother, and the townlands around where each hound fought is also named after each dog. There is a final part of this story, but I don't know how they connect - An Mhuc Dhubh translates as the Black Pig. This was how locals christened the arrival of the first steam engine 100 years ago. Puffing, "snorting", and billowing plumes of black smoke, this monstrous creature evoked memories of St. Colmcille's prophesy centuries earlier: that there would never be peace in Ireland until the return of the wild pig to the shores of Loch Finn! The SlÃ­ na Finne video!